Hope your chickens do well. 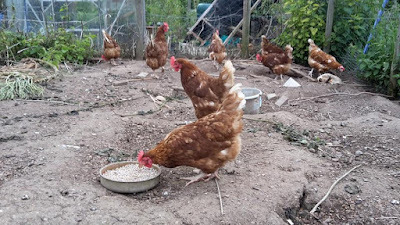 On Facebook France there was a request to rehome several thousand factory chickens who were in a poor state of being, but we are still involved with getting the chicken project finished so had no space to take some in. Nearly all our egg laying hens are rescued ex-commercial. Apart from costing hardly anything they lay straight away. Also, they don't seem to go broody. Most of the eggs are sold at the gate or to regular customers. 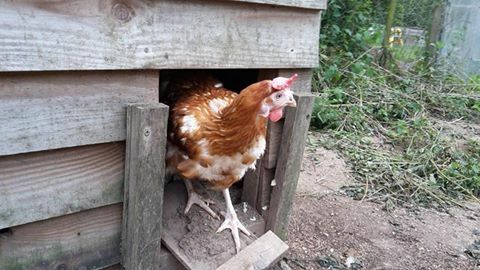 I've tried to get hold of similar hens here, but no-one seems to have any! We've always had great success with ex-commercial free rangers. They are lovely birds usually. Very friendly and inquisitive after their year as part of a HUGE flock. They seem to settle in well as part of a smaller one. We've just got some new birds for our small flock, just 4 this time. Unfortunately all the eggs our broodys have been sitting on have turned out not to be fertilised. I think our cockerel is firing blanks!! Hope you get lots of eggs to sell from your new batch, the thing with buying them this way is you recoup the cost of them very quickly. Kev, they look kind of beat up. Did they attack each other or was that how it was where they came from?